How could Israel be led into idolatry just after hearing the law forbidding it thundered from the mountain? While Moses was absent it was a time of waiting and suspense to Israel. The people knew that he had ascended the mount with Joshua, and had entered the cloud of thick darkness which could be seen from the plain below, resting on the mountain peak, illuminated from time to time with the lightnings of the divine Presence. They waited eagerly for his return. Accustomed as they had been in Egypt to material representations of deity, it had been hard for them to trust in an invisible being, and they had come to rely upon Moses to sustain their faith. Now he was taken from them. Day after day, week after week passed, and still he did not return. Notwithstanding the cloud was still in view, it seemed to many in the camp that their leader had deserted them, or that he had been consumed by the devouring fire. During this period of waiting, there was time for them to meditate upon the law of God which they had heard, and to prepare their hearts to receive the further revelations that He might make to them. They had none too much time for this work; and had they been thus seeking a clearer understanding of God's requirements, and humbling their hearts before Him, they would have been shielded from temptation. But they did not do this, and they soon became careless, inattentive, and lawless. Especially was this the case with the mixed multitude. They were impatient to be on their way to the Land of Promise—the land flowing with milk and honey. It was only on condition of obedience that the goodly land was promised them, but they had lost sight of this. There were some who suggested a return to Egypt, but whether forward to Canaan or backward to Egypt, the masses of the people were determined to wait no longer for Moses. Feeling their helplessness in the absence of their leader, they [p. 316] returned to their old superstitions. The "mixed multitude" had been the first to indulge murmuring and impatience, and they were the leaders in the apostasy that followed. Among the objects regarded by the Egyptians as symbols of deity was the ox or calf; and it was at the suggestion of those who had practiced this form of idolatry in Egypt that a calf was now made and worshiped. The people desired some image to represent God, and to go before them in the place of Moses. God had given no manner of similitude of Himself, and He had prohibited any material representation for such a purpose. The mighty miracles in Egypt and at the Red Sea were designed to establish faith in Him as the invisible, all-powerful Helper of Israel, the only true God. And the desire for some visible manifestation of His presence had been granted in the pillar of cloud and of fire that guided their hosts, and in the revealing of His glory upon Mount Sinai. But with the cloud of the Presence still before them, they turned back in their hearts to the idolatry of Egypt, and represented the glory of the invisible God by the similitude of an ox! In the absence of Moses, the judicial authority had been delegated to Aaron, and a vast crowd gathered about his tent, with the demand, "Make us gods, which shall go before us; for as for this Moses, the man that brought us up out of the land of Egypt, we wot not what is become of him. [* See Appendix, Note 4.] The cloud, they said, that had heretofore led them, now rested permanently upon the mount; it would no longer direct their travels. They must have an image in its place; and if, as had been suggested, they should decide to return to Egypt, they would find favor with the Egyptians by bearing this image before them and acknowledging it as their god. Such a crisis demanded a man of firmness, decision, and unflinching courage; one who held the honor of God above popular favor, personal safety, or life itself. But the present leader of Israel was not of this character. Aaron feebly remonstrated with the people, but his wavering and timidity at the critical moment only rendered them the more determined. The tumult increased. A blind, unreasoning frenzy seemed to take possession of the multitude. There were some who remained true to their covenant with God, but the greater part of the people joined in the apostasy. A few who ventured to denounce the proposed image [p. 317] making as idolatry, were set upon and roughly treated, and in the confusion and excitement they finally lost their lives. Aaron feared for his own safety; and instead of nobly standing up for the honor of God, he yielded to the demands of the multitude. His first act was to direct that the golden earrings be collected from all the people and brought to him, hoping that pride would lead them to refuse such a sacrifice. But they willingly yielded up their ornaments; and from these he made a molten calf, in imitation of the gods of Egypt. The people proclaimed, "These be thy gods, O Israel, which brought thee up out of the land of Egypt." And Aaron basely permitted this insult to Jehovah. He did more. Seeing with what satisfaction the golden god was received, he built an altar before it, and made proclamation, "Tomorrow is a feast to the Lord." The announcement was heralded by trumpeters from company to company throughout the camp. "And they rose up early on the morrow, and offered burnt offerings, and brought peace offerings; and the people sat down to eat and to drink and rose up to play." Under the pretense of holding "a feast to the Lord," they gave themselves up to gluttony and licentious reveling. How often, in our own day, is the love of pleasure disguised by a "form of godliness."! A religion that permits men, while observing the rites of worship, to devote themselves to selfish or sensual gratification, is as pleasing to the multitudes now as in the days of Israel. And there are still pliant Aarons, who, while holding positions of authority in the church, will yield to the desires of the unconsecrated, and thus encourage them in sin. Only a few days had passed since the Hebrews had made a solemn covenant with God to obey His voice. They had stood trembling with terror before the mount, listening to the words of the Lord, "Thou shalt have no other gods before Me." The glory of God still hovered above Sinai in the sight of the congregation; but they turned away, and asked for other gods. "They made a calf in Horeb, and worshiped the molten image. Thus they changed their glory into the similitude of an ox." Psalm 106:19, 20. How could greater ingratitude have been shown, or more daring insult offered, to Him who had revealed Himself to them as a tender father and an all-powerful king! Moses in the mount was warned of the apostasy in the camp [p. 318] and was directed to return without delay. "Go, get thee down," were the words of God; "thy people, which thou broughtest out of the land of Egypt, have corrupted themselves: they have turned aside quickly out of the way which I commanded them. They have made them a molten calf, and have worshiped it." God might have checked the movement at the outset; but He suffered it to come to this height that He might teach all a lesson in His punishment of treason and apostasy. God's covenant with His people had been disannulled, and He declared to Moses, "Let Me alone, that My wrath may wax hot against them, and that I may consume them: and I will make of thee a great nation." The people of Israel, especially the mixed multitude, would be constantly disposed to rebel against God. They would also murmur against their leader, and would grieve him by their unbelief and stubbornness, and it would be a laborious and soul-trying work to lead them through to the Promised Land. Their sins had already forfeited the favor of God, and justice called for their destruction. The Lord therefore proposed to destroy them, and make of Moses a mighty nation. "Let Me alone, . . . that I may consume them," were the words of God. If God had purposed to destroy Israel, who could plead for them? How few but would have left the sinners to their fate! How few but would have gladly exchanged a lot of toil and burden and sacrifice, repaid with ingratitude and murmuring, for a position of ease and honor, when it was God Himself that offered the release. But Moses discerned ground for hope where there appeared only discouragement and wrath. The words of God, "Let Me alone," he understood not to forbid but to encourage intercession, implying that nothing but the prayers of Moses could save Israel, but that if thus entreated, God would spare His people. He "besought the Lord his God, and said, Lord, why doth Thy wrath wax hot against Thy people, which Thou hast brought forth out of the land of Egypt with great power, and with a mighty hand?" God had signified that He disowned His people. He had spoken of them to Moses as "thy people, which thou broughtest out of Egypt." But Moses humbly disclaimed the leadership of Israel. They were not his, but God's—"Thy people, which Thou has brought forth . . . with great power, and with a mighty [p. 319] hand. Wherefore," he urged, "should the Egyptians speak, and say, For mischief did He bring them out, to slay them in the mountains, and to consume them from the face of the earth?" During the few months since Israel left Egypt, the report of their wonderful deliverance had spread to all the surrounding nations. Fear and terrible foreboding rested upon the heathen. All were watching to see what the God of Israel would do for His people. Should they now be destroyed, their enemies would triumph, and God would be dishonored. The Egyptians would claim that their accusations were true—instead of leading His people into the wilderness to sacrifice, He had caused them to be sacrificed. They would not consider the sins of Israel; the destruction of the people whom He had so signally honored, would bring reproach upon His name. How great the responsibility resting upon those whom God has highly honored, to make His name a praise in the earth! With what care should they guard against committing sin, to call down His judgments and cause His name to be reproached by the ungodly! As Moses interceded for Israel, his timidity was lost in his deep interest and love for those for whom he had, in the hands of God, been the means of doing so much. The Lord listened to his pleadings, and granted his unselfish prayer. God had proved His servant; He had tested his faithfulness and his love for that erring, ungrateful people, and nobly had Moses endured the trial. His interest in Israel sprang from no selfish motive. The prosperity of God's chosen people was dearer to him than personal honor, dearer than the privilege of becoming the father of a mighty nation. God was pleased with his faithfulness, his simplicity of heart, and his integrity, and He committed to him, as a faithful shepherd, the great charge of leading Israel to the Promised Land. As they drew near the encampment, they beheld the people shouting and dancing around their idol. It was a scene of heathen riot, an imitation of the idolatrous feasts of Egypt; but how unlike the solemn and reverent worship of God! Moses was overwhelmed. He had just come from the presence of God's glory, and though he had been warned of what was taking place, he was unprepared for that dreadful exhibition of the degradation of Israel. His anger was hot. To show his abhorrence of their crime, he threw down the tables of stone, and they were broken in the sight of all the people, thus signifying that as they had broken their covenant with God, so God had broken His covenant with them. 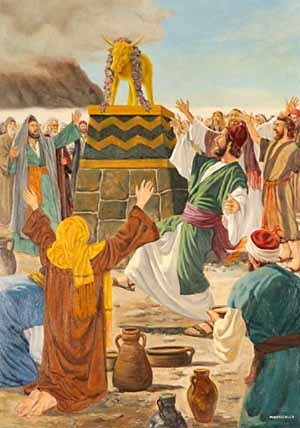 Entering the camp, Moses passed through the crowds of revelers, and seizing upon the idol, cast it into the fire. He afterward ground it to powder, and having strewed it upon the stream that descended from the mount, he made the people drink of it. Thus was shown the utter worthlessness of the god which they had been worshiping. The great leader summoned his guilty brother and sternly demanded, "What did this people unto thee, that thou hast brought so great a sin upon them?" Aaron endeavored to shield himself by relating the clamors of the people; that if he had not complied with their wishes, he would have been put to death. "Let not the anger of my lord wax hot," he said; "thou knowest the people, that they are set on mischief. For they said unto me, Make us gods, which shall go before us: for as for this Moses, the man that brought us up out of the land of Egypt, we wot not what is become of him. And I said unto them, Whosoever hath any gold, let them break it off. So they gave it me: then I cast it into the fire, and there came out this calf." He would lead Moses to believe that a miracle had been wrought—that the gold had been cast into the fire, and by supernatural power changed to a calf. But his excuses and prevarications were of no avail. He was justly dealt with as the chief offender. The fact that Aaron had been blessed and honored so far above the people was what made his sin so heinous. It was Aaron "the saint of the Lord" (Psalm 106:16), that had made the idol and announced the feast. It was he who had been appointed as spokesman for Moses, and concerning whom God Himself had testified, "I know that he can speak well" (Exodus 4:14), that had failed to check the idolaters in their heaven-daring purpose. [p. 323] He by whom God had wrought in bringing judgments both upon the Egyptians and upon their gods, had heard unmoved the proclamation before the molten image, "These be thy gods, O Israel, which brought thee up out of the land of Egypt." It was he who had been with Moses on the mount, and had there beheld the glory of the Lord, who had seen that in the manifestation of that glory there was nothing of which an image could be made—it was he who had changed that glory into the similitude of an ox. He to whom God had committed the government of the people in the absence of Moses, was found sanctioning their rebellion. "The Lord was very angry with Aaron to have destroyed him." Deuteronomy 9:20. But in answer to the earnest intercession of Moses, his life was spared; and in penitence and humiliation for his great sin, he was restored to the favor of God. If Aaron had had courage to stand for the right, irrespective of consequences, he could have prevented that apostasy. If he had unswervingly maintained his own allegiance to God, if he had cited the people to the perils of Sinai, and had reminded them of their solemn covenant with God to obey His law, the evil would have been checked. But his compliance with the desires of the people and the calm assurance with which he proceeded to carry out their plans, emboldened them to go to greater lengths in sin than had before entered their minds. When Moses, on returning to the camp, confronted the rebels, his severe rebukes and the indignation he displayed in breaking the sacred tables of the law were contrasted by the people with his brother's pleasant speech and dignified demeanor, and their sympathies were with Aaron. To justify himself, Aaron endeavored to make the people responsible for his weakness in yielding to their demand; but notwithstanding this, they were filled with admiration of his gentleness and patience. But God seeth not as man sees. Aaron's yielding spirit and his desire to please had blinded his eyes to the enormity of the crime he was sanctioning. His course in giving his influence to sin in Israel cost the life of thousands. In what contrast with this was the course of Moses, who, while faithfully executing God's judgments, showed that the welfare of Israel was dearer to him than prosperity or honor or life. Of all the sins that God will punish, none are more grievous in His sight than those that encourage others to do evil. God [p. 324] would have His servants prove their loyalty by faithfully rebuking transgression, however painful the act may be. Those who are honored with a divine commission are not to be weak, pliant time-servers. They are not to aim at self-exaltation, or to shun disagreeable duties, but to perform God's work with unswerving fidelity. The Israelites had been guilty of treason, and that against a King who had loaded them with benefits and whose authority they had voluntarily pledged themselves to obey. That the divine [p. 325] government might be maintained justice must be visited upon the traitors. Yet even here God's mercy was displayed. While He maintained His law, He granted freedom of choice and opportunity for repentance to all. Only those were cut off who persisted in rebellion. It was necessary that this sin should be punished, as a testimony to surrounding nations of God's displeasure against idolatry. By executing justice upon the guilty, Moses, as God's instrument, must leave on record a solemn and public protest against their crime. As the Israelites should hereafter condemn the idolatry of the neighboring tribes, their enemies would throw back upon them the charge that the people who claimed Jehovah as their God had made a calf and worshiped it in Horeb. Then though compelled to acknowledge the disgraceful truth, Israel could point to the terrible fate of the transgressors, as evidence that their sin had not been sanctioned or excused. Love no less than justice demanded that for this sin judgment should be inflicted. God is the guardian as well as the sovereign of His people. He cuts off those who are determined upon rebellion, that they may not lead others to ruin. In sparing the life of Cain, God had demonstrated to the universe what would be the result of permitting sin to go unpunished. The influence exerted upon his descendants by his life and teaching led to the state of corruption that demanded the destruction of the whole world by a flood. The history of the antediluvians testifies that long life is not a blessing to the sinner; God's great forbearance did not repress their wickedness. The longer men lived, the more corrupt they became. So with the apostasy at Sinai. Unless punishment had been speedily visited upon transgression, the same results would again have been seen. The earth would have become as corrupt as in the days of Noah. Had these transgressors been spared, evils would have followed, greater than resulted from sparing the life of Cain. It was the mercy of God that thousands should suffer, to prevent the necessity of visiting judgments upon millions. In order to save the many, He must punish the few. Furthermore, as the people had cast off their allegiance to God, they had forfeited the divine protection, and, deprived of their defense, the whole nation was exposed to the power of their enemies. Had not the evil been promptly put away, they would soon have fallen a prey to their numerous and powerful foes. It was necessary [p. 326] for the good of Israel, and also as a lesson to all succeeding generations, that crime should be promptly punished. And it was no less a mercy to the sinners themselves that they should be cut short in their evil course. Had their life been spared, the same spirit that led them to rebel against God would have been manifested in hatred and strife among themselves, and they would eventually have destroyed one another. It was in love to the world, in love to Israel, and even to the transgressors, that crime was punished with swift and terrible severity. As the people were roused to see the enormity of their guilt, terror pervaded the entire encampment. It was feared that every offender was to be cut off. Pitying their distress, Moses promised to plead once more with God for them. "Ye have sinned a great sin," he said, "and now I will go up unto the Lord; peradventure I shall make an atonement for your sin." He went, and in his confession before God he said, "Oh, this people have sinned a great sin, and have made them gods of gold. Yet now if Thou wilt forgive their sin—; and if not, blot me, I pray Thee, out of Thy book which Thou hast written." The answer was, "Whosoever hath sinned against Me, him will I blot out of My book. Therefore now go, lead the people into the place of which I have spoken unto thee: behold, Mine Angel shall go before thee: nevertheless, in the day when I visit, I will visit their sin upon them." In the prayer of Moses our minds are directed to the heavenly records in which the names of all men are inscribed, and their deeds, whether good or evil, are faithfully registered. The book of life contains the names of all who have ever entered the service of God. If any of these depart from Him, and by stubborn persistence in sin become finally hardened against the influences of His Holy Spirit, their names will in the judgment be blotted from the book of life, and they themselves will be devoted to destruction. Moses realized how dreadful would be the fate of the sinner; yet if the people of Israel were to be rejected by the Lord, he desired his name to be blotted out with theirs; he could not endure to see the judgments of God fall upon those who had been so graciously delivered. The intercession of Moses in behalf of Israel illustrates the mediation of Christ for sinful men. But the Lord did not permit Moses to bear, as did Christ, the guilt of the transgressor. "Whosoever [p. 327] hath sinned against Me," He said, "him will I blot out of My book." In deep sadness the people had buried their dead. Three thousand had fallen by the sword; a plague had soon after broken out in the encampment; and now the message came to them that the divine Presence would no longer accompany them in their journeyings. Jehovah had declared, "I will not go up in the midst of thee; for thou art a stiffnecked people: lest I consume thee in the way." And the command was given, "Put off thy ornaments from thee, that I may know what to do unto thee." Now there was mourning throughout the encampment. In penitence and humiliation "the children of Israel stripped themselves of their ornaments by the mount Horeb." By the divine direction the tent that had served as a temporary place of worship was removed "afar off from the camp." This was still further evidence that God had withdrawn His presence from them. He would reveal Himself to Moses, but not to such a people. The rebuke was keenly felt, and to the conscience-smitten multitudes it seemed a foreboding of greater calamity. Had not the Lord separated Moses from the camp that He might utterly destroy them? But they were not left without hope. The tent was pitched without the encampment, but Moses called it "the tabernacle of the congregation." All who were truly penitent, and desired to return to the Lord, were directed to repair thither to confess their sins and seek His mercy. When they returned to their tents Moses entered the tabernacle. With agonizing interest the people watched for some token that his intercessions in their behalf were accepted. If God should condescend to meet with him, they might hope that they were not to be utterly consumed. When the cloudy pillar descended, and stood at the entrance of the tabernacle, the people wept for joy, and they "rose up and worshiped, every man in his tent door." Moses knew well the perversity and blindness of those who were placed under his care; he knew the difficulties with which he must contend. But he had learned that in order to prevail with the people, he must have helped from God. He pleaded for a clearer revelation of God's will and for an assurance of His presence: "See, Thou sayest unto me, Bring up this people: and Thou hast not let me know whom Thou wilt send with me. Yet Thou [p. 328] hast said, I know thee by name, and thou hast also found grace in My sight. Now therefore, I pray Thee, if I have found grace in Thy sight, show me now Thy way, that I may know Thee, that I may find grace in Thy sight: and consider that this nation is Thy people." The answer was, "My presence shall go with thee, and I will give thee rest." But Moses was not yet satisfied. There pressed upon his soul a sense of the terrible results should God leave Israel to hardness and impenitence. He could not endure that his interests should be separated from those of his brethren, and he prayed that the favor of God might be restored to His people, and that the token of His presence might continue to direct their journeyings: "If Thy presence go not with me, carry us not up hence. For wherein shall it be known here that I and Thy people have found grace in Thy sight? is it not in that Thou goest with us? So shall we be separated, I and Thy people, from all the people that are upon the face of the earth." And the Lord said, "I will do this thing also that thou hast spoken: for thou hast found grace in My sight, and I know thee by name." Still the prophet did not cease pleading. Every prayer had been answered, but he thirsted for greater tokens of God's favor. He now made a request that no human being had ever made before: "I beseech Thee, show me Thy glory." God did not rebuke his request as presumptuous; but the gracious words were spoken, "I will make all My goodness pass before thee." The unveiled glory of God, no man in this mortal state can look upon and live; but Moses was assured that he should behold as much of the divine glory as he could endure. Again he was summoned to the mountain summit; then the hand that made the world, that hand that "removeth the mountains, and they know not" (Job 9:5), took this creature of the dust, this mighty man of faith, and placed him in a cleft of the rock, while the glory of God and all His goodness passed before him. To the transgressor it is a fearful thing to fall into the hands of the living God; but Moses stood alone in the presence of the Eternal One, and he was not afraid; for his soul was in harmony with the will of his Maker. Says the psalmist, "If I regard iniquity in my heart, the Lord will not hear me." Psalm 66:18. But "the secret of the Lord is with them that fear Him; and He will show them His covenant." Psalm 25:14. The Deity proclaimed Himself, "The Lord, The Lord God, merciful and gracious, long-suffering, and abundant in goodness and truth, keeping mercy for thousands, forgiving iniquity and transgression and sin, and that will by no means clear the guilty." "Moses made haste, and bowed his head toward the earth, and worshiped." Again he entreated that God would pardon the iniquity of His people, and take them for His inheritance. His prayer was granted. The Lord graciously promised to renew His favor to Israel, and in their behalf to do marvels such as had not been done "in all the earth, nor in any nation." During that long time spent in communion with God, the face of Moses had reflected the glory of the divine Presence; unknown to himself his face shown with a dazzling light when he descended from the mountain. Such a light illumined the countenance of Stephen when brought before his judges; "and all that sat in the council, looking steadfastly on him, saw his face as it had been the face of an angel." Acts 6:15. Aaron as well as the people shrank away from Moses, and "they were afraid to come nigh him." Seeing their confusion and terror, but ignorant of the cause, he urged them to come near. He held out to them the pledge of God's reconciliation, and assured them of His restored favor. They perceived in his voice nothing but love and entreaty, and at last one ventured to approach him. Too awed to speak, he silently pointed to the countenance of Moses, and then toward [p. 330] heaven. The great leader understood his meaning. In their conscious guilt, feeling themselves still under the divine displeasure, they could not endure the heavenly light, which, had they been obedient to God, would have filled them with joy. There is fear in guilt. The soul that is free from sin will not wish to hide from the light of heaven. Moses had much to communicate to them; and compassionating their fear, he put a veil upon his face, and continued to do so thereafter whenever he returned to the camp from communion with God. By this brightness God designed to impress upon Israel the sacred, exalted character of His law, and the glory of the gospel revealed through Christ. While Moses was in the mount, God presented to him, not only the tables of the law, but also the plan of salvation. He saw that the sacrifice of Christ was pre-figured by all the types and symbols of the Jewish age; and it was the heavenly light streaming from Calvary, no less than the glory of the law of God, that shed such a radiance upon the face of Moses. That divine illumination symbolized the glory of the dispensation of which Moses was the visible mediator, a representative of the one true Intercessor. The glory reflected in the countenance of Moses illustrates the blessings to be received by God's commandment-keeping people through the mediation of Christ. It testifies that the closer our communion with God, and the clearer our knowledge of His requirements, the more fully shall we be conformed to the divine image, and the more readily do we become partakers of the divine nature. Moses was a type of Christ. As Israel's intercessor veiled his countenance, because the people could not endure to look upon its glory, so Christ, the divine Mediator, veiled His divinity with humanity when He came to earth. Had He come clothed with the brightness of heaven, he could not have found access to men in their sinful state. They could not have endured the glory of His presence. Therefore He humbled Himself, and was made "in the likeness of sinful flesh (Romans 8:3), that He might reach the fallen race, and lift them up. Click here to read the next chapter: "Satan's Enmity Against the Law"